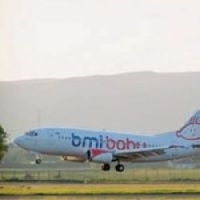 BUDGET airline BMI Baby is to cease operations from September – with some routes out of Paris and Nice being halted from June 11. The BMI Baby decision came after its new owner IAG – the parent company of British Airways – bought the airline and BMI Regional when it aquired BMI from Lufthansa. BMI Baby has been losing about £25m a year and there are fears for the future of the 500 staff, many at its East Midlands base. Services from East Midlands to Paris, Nice, Amsterdam, Edinburgh, Geneva and Newquay will stop on June 11. Services from Birmingham to Knock and Amsterdam also halt on the same day, as will all flights using Belfast. The Birmingham-Nice service continues after June 11. BMI interim managing director Peter Simpson said in a letter to staff that BMI Baby had “delivered high levels of operational performance and customer service, but has continued to struggle financially, losing more than £100m in the last four years”. He apologised to customers for changes from June and said they would be “providing full refunds and doing all we can with other airlines to mitigate the impact of these changes”.